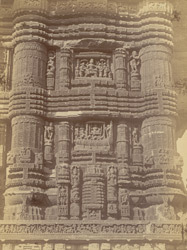 Photograph of the sculptural panles in the Jagannatha Temple at Puri, from the Archaeological Survey of India Collections, taken by Poorno Chander Mukherji in the 1890s. Puri in Orissa, is one of the four traditional pilgrimage centres for Hindus, and the centre of the cult of Jagannatha, a form of Krishna. The main shrine, with a towered sanctuary and mandapa with a pyramidal roof, is attributed to Anantavarman Chodaganga of the Eastern Ganga dynasty (r.1077-1147). Other mandapas were added in the 13th and 15th Centuries. The rectangular complex has many other minor shrines and is within a high double-walled enclosure with four gates at the cardinal points. The mandapa walls are elaborately treated with sculptural and architectural elements and the facade is divided into numerous panels through horizontal mouldings and pilasters. The carvings display a royal iconography: the top panel in this photograph shows a king seated with attendants and the central panel shows a royal figure being rowed in a boat.